When his mother Mary had been betrothed to Joseph, before they came together she was found to be with child from the Holy Spirit. And her husband Joseph, being a just man and unwilling to put her to shame, resolved to divorce her quietly. But as he considered these things, behold, an angel of the Lord appeared to him in a dream, saying, "Joseph, son of David, do not fear to take Mary as your wife, for that which is conceived in her is from the Holy Spirit. She will bear a son, and you shall call his name Jesus, for he will save his people from their sins." When Joseph woke from sleep, he did as the angel of the Lord commanded him: he took his wife, but knew her not until she had given birth to a son. And he called his name Jesus (which means, God with us). When Joseph woke from sleep, he did as the angel of the Lord commanded him: he took his wife, but knew her not until she had given birth to a son. And he called his name Jesus. Marriage in the time of Christ was done much differently than it is today. It was a two-part process, and the two ceremonies were separated by a long span of time: six months to a year. The first part, the betrothal, was the more important of the two. Like an engagement today, this gave the couple time to get all their affairs in order before they began their life together, but unlike an engagement, the betrothal was the primary act. The couple took their vows at the betrothal ceremony, payment was made by the groom's family to the bride and/or her father, and the laws against adultery applied to them. 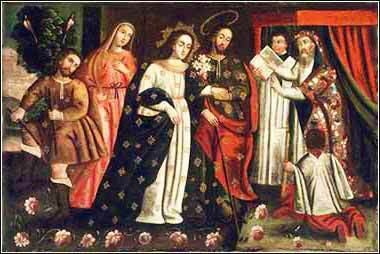 We do not know how old Mary was when she was betrothed to Joseph, but the customary age of betrothal for Jewish girls was 12 1/2. She could have been older, but as strange as it seems to us, today, Mary was most likely 13 or 14 years old when Jesus was born. Mark indicates that Joseph and Mary had not yet taken the second, final step when Joseph discovered the pregnancy. Mark writes that Joseph "took his wife, but did not know her". The second part of the marriage process was when the groom literally "took" his wife; he received her at her father's house, and after a few words and a party, she left to live with him. As an historical note, by the time of Joseph and Mary, the marriage process had changed quite a bit since the early days of the Bible. Originally, the husband would go to live with his bride, at least for a period; and the betrothal was originally a purchase by the groom (or groom's father) from the bride's father. By the time of Jesus' birth, the girl was apparently given some say in the matter and the bridal price was a smaller gift, at least partly given directly to her. Marriage had become more of a union and less of a transaction. The great point of the passage today is Joseph's acquiescence in God's plan. Even though Mary and Jesus are the central figures in the story of Christmas, Joseph was a God-fearing man and greatly faithful. It was no small matter for him to accept a pregnant woman as his wife, or to forgo the marriage bed until her child was born.